The RAM Model 3350 ‘SingFlex’ Twin40 headblock system for use on Single Hoist Ship to Shore Cranes is designed in accordance with DIN 15018. Manufactured from high quality steel and components, the headblock provides robust and reliable operations in demanding container terminal environments. 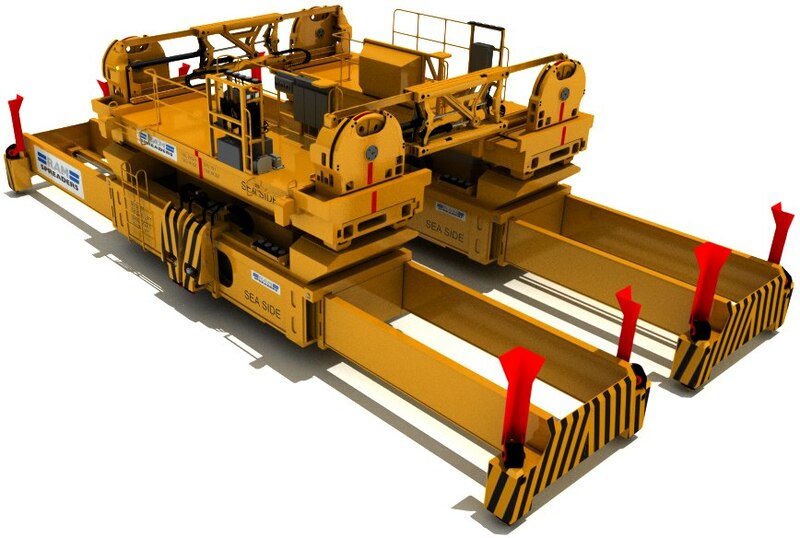 Designed to allow single or multiple containers to be handled safely and reliably in a single crane operation, the ‘SingFlex’ headblock can be retrofitted to most existing container handling cranes with connection between the ‘SingFlex’ headblock and spreaders by ISO floating twistlocks. Capable of handling in single lift spreader operation 20ft/30ft/40ft/45ft ISO containers (subject to spreader capability) or alternatively in twin lift spreader mode 2 x 20ft / 2 x 40ft / 2 x 30ft or 4 x 20ft ISO containers, with features allowing spreaders and containers to be manipulated using onboard mechanisms for precise positioning during loading or discharge operations. ‘SingFlex’ is electro-hydraulically operated with all functions of the headblock controlled from the crane operator’s cabin. In twin spreader mode, gap adjustment between spreaders can be increased from zero to 1600mm (5’3”). The centre gap can be adjusted when the spreader is either unladen or is lifting multiple containers. Change-over from single spreader mode to twin spreader mode and visa versa is fully automated and allows the crane operator to switch from single to twin headblock without assistance from support staff, changeover time from single to twin headblock and visa versa in under 2 minutes.